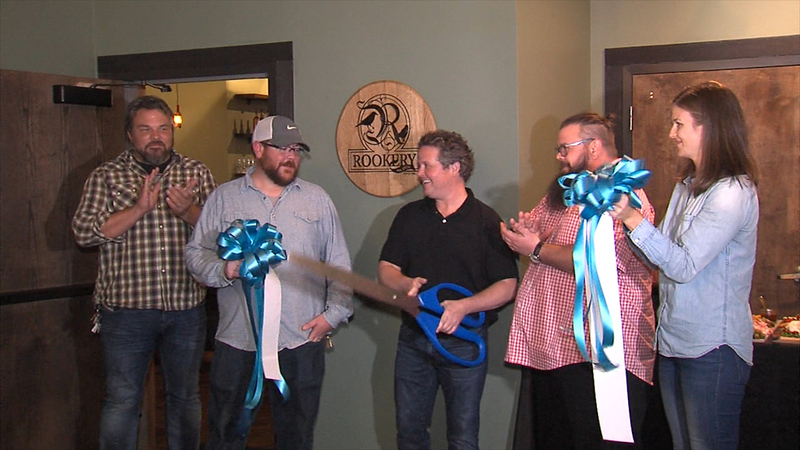 On Thursday, November 2nd, Main Street Macon held a ribbon cutting to celebrate the expansion of The Rookery, a downtown Macon landmark. After eight years of serving Middle Georgia handspun milkshakes and innovative burgers, The Moonhanger Group purchased the building next door at 533 Cherry Street with intentions to expand The Rookery’s dining space and kitchen. The newly renovated building includes a larger kitchen and 3,000 square feet of additional dining space. The Rookery’s expansion also includes the addition of The Creek Stage, a new venue in downtown Macon to accommodate Macon’s growing music scene. The venue seats 100 people and includes a 15-foot stage and full-service bar. Performances on The Creek Stage will begin on Saturday, November 4 with a concert by War and Treaty, which is already sold out. The Rookery is now serving patrons in the newly expanded space. The Rookery is open Sunday through Thursday from 11am to 10pm and Fridays and Saturdays from 11am to 10:30pm. To learn more about The Rookery visit www.rookerymacon.com. For schedules and to purchase tickets for The Creek Stage, go to www.coxcapitoltheatre.com or in person at The Rookery and El Camino.